After the success of my Christmas runs, I didn’t really run for about six weeks. 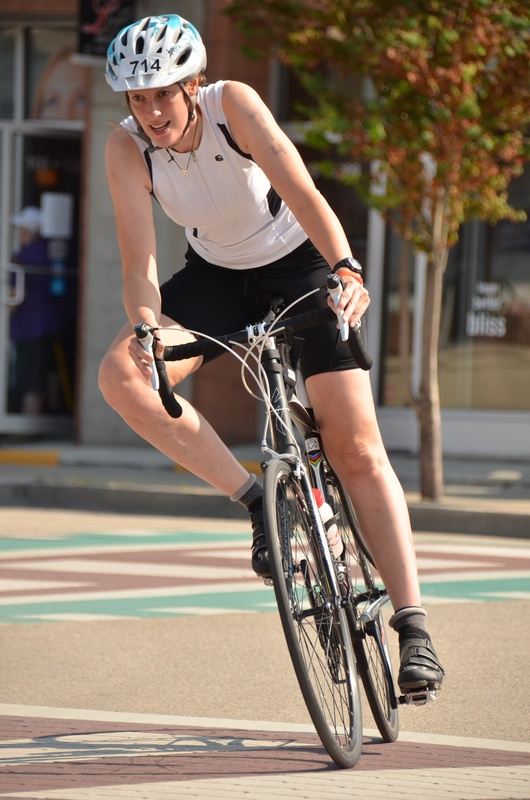 I could feel the shin splints beginning to rear their heads a d so I focused on cycling to try to maintain running fitness with a lower risk of injury. 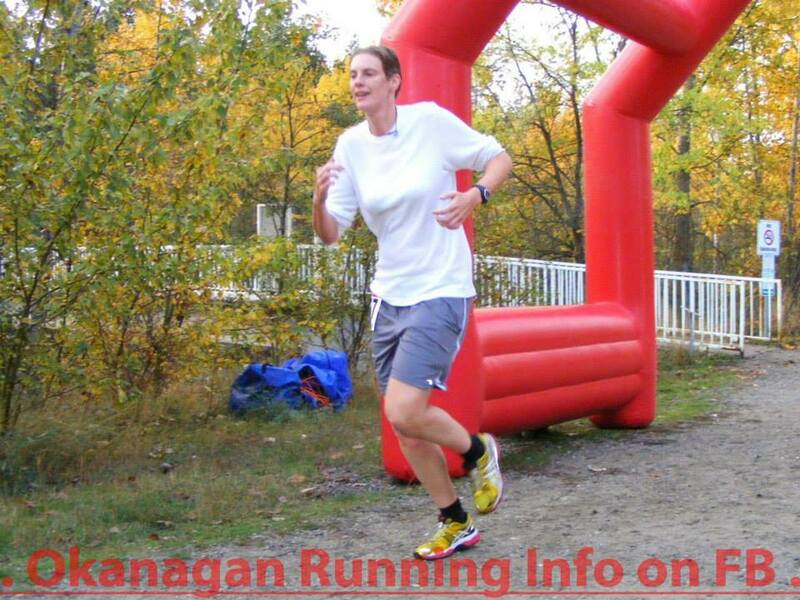 The Lavington 10k is the first race of the Interior Running Association season. It is a beautiful course largely in the middle of nowhere, mostly flat bit with a few rolling hills. It seemed like as good a time as any to kick-start the 2015 season. The interior running Association is made up of local club runners, a slightly faster field than the more ‘generic races I usually partake in. When I woke up that morning, I looked out of the window to try to ascertain the weather conditions, which would inform my clothing choices. I decided to throw a couple of different options into the car as I headed out to the race. After checking in and getting my number (and waiting in an incredibly long bathroom queue), I still didn’t know what to wear. It was very cold, but the sun was starting to peek through, so after much indecision, I opted for a T-shirt but long pants and gloves. It was risky, but I hoped it would warm up quickly and thus eliminate the need to carry a sweater for much of the race. Thanks SeeKayTri for this picture! Right from the start, the field swarmed past me. I was ready for that, I had decided to start off slow, but still, as I looked back, there didn’t seem to be many people left. 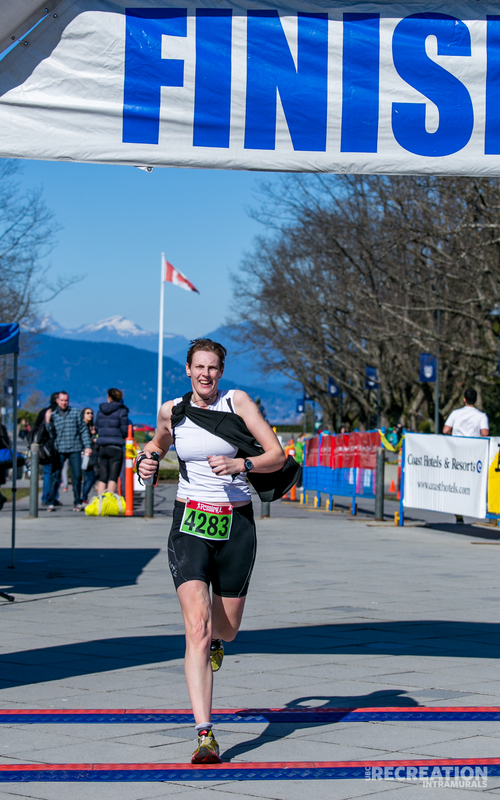 Coming last is a constant worry for me, particularly in smaller, faster races; but I pushed it to the back of my mind and focused on maintaining a steady pace. I saw the 1km marker. Great, just need to do that nine more times…I can do that. People were still passing me. I seemed to be running so slowly. As if to underscore this point, at that moment, my friend Markus came past me, congratulating me on my ‘marathon pace’ as he did so. This should be 10k pace! Wow I really am slow. Nevertheless, I ran on. I needed to maintain a good marathon pace for Ironman, so if today I couldn’t manage a 10k pace, I would make it practice for that. Just need to do that four more times… I can do that. I kept running, people kept slowly passing me, but my pace felt nice, my heart rate was good, this was sustainable. Just need to do that three, no, three and a bit times… (OK, I admit that little piece of math stumped me as I ran on). Around this time I started to get a stitch. This was interesting as I haven’t really had that problem since I learned to run seven years ago. It wasn’t too bad though, I could still run, but it wasn’t going away. 4km took us into the shade of some trees, I briefly wished I has gone with long sleeves, but after about a kilometre (which felt like forever), we emerged back out into the sun (such as it was) again. Then the stitch really kicked in. I tried all of the usual stretches, massaging, poking and swearing, none of them seemed to work. I wondered how much faster I would be able to go if I could breathe properly. That 3km was pretty miserable actually. Luckily by 8km it was beginning to fade, there was light at the end of the tunnel. Just 2km to go… I KNOW I can do that! I began to zero in on a single runner ahead of me and slowly (oh so slowly) catching and passing them. The slower pace at the start beginning to pay off. As I came close to the finish I kicked up my speed a notch. I passed two more people. I came to the final turn, about 25m to go. Someone yelled that I would be under 65 minutes. There was one more person between me and the line. I could hear my friends shouting my name. If I had had even three more paces I would have passed her, but it wasn’t to be. 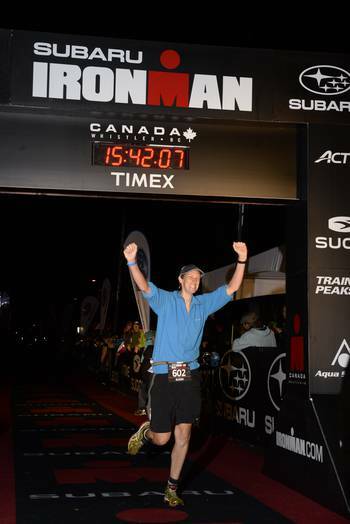 My final time was 1:03:37 a full six minutes faster than my last 10km race. I obviously wasn’t going as slowly as I had initially feared, perhaps it was an illusion caused by the proportionally faster field. A pretty good start to the year. 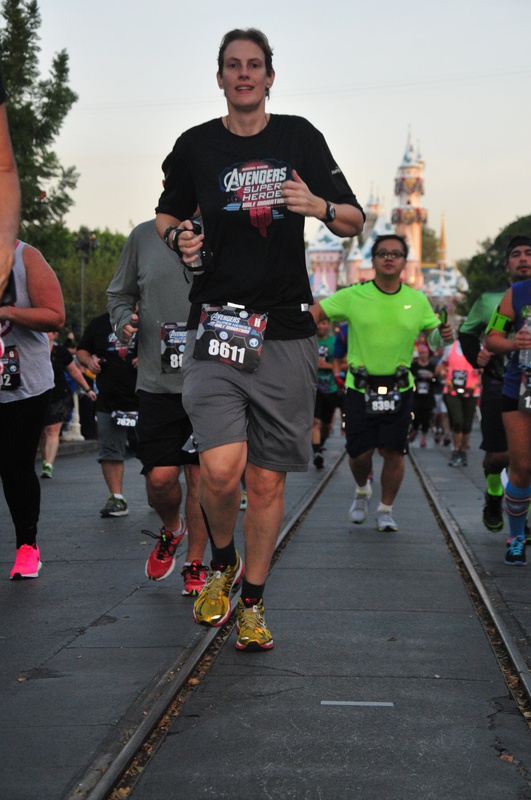 How could an Avengers themed half marathon at Disneyland not be fun? I posed this question to a few friends, and it turns out they had a rather long list of reasons. Most seemed perturbed by the half marathon aspect, but wished me luck anyway. 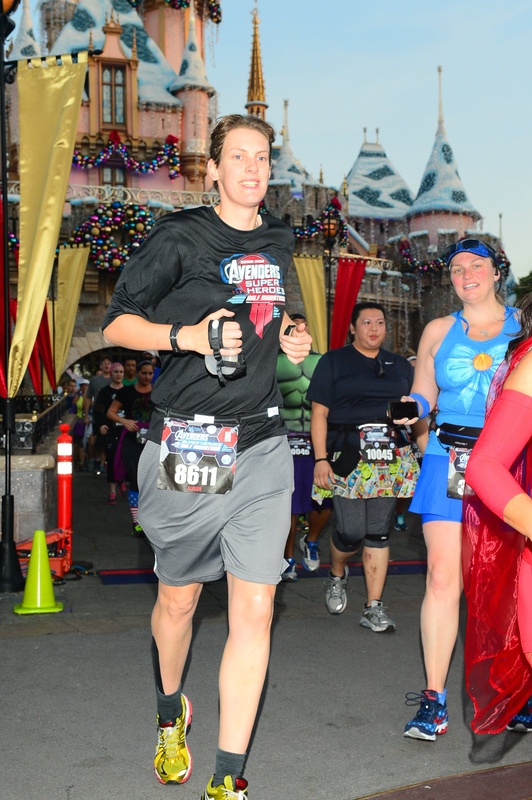 Those not averse to the thought of running 21.1km thought that Disneyland was generally excessive and not very serious. – but were ‘sure I’d enjoy it’. Still being the ‘collector’ type, I signed up anyway. Now, if you have been following my blog (if you haven’t, where have you been? 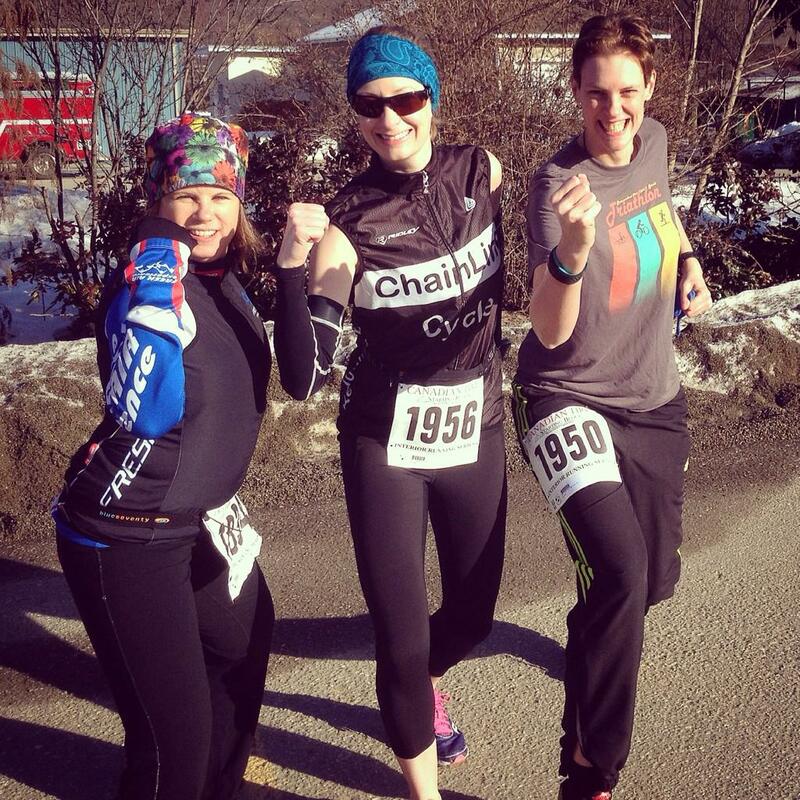 ), you will know that having signed up for this race in the spring, my training rather got derailed over the summer. Four weeks out, as I checked my calendar, my longest run had been 9km. Not even half of my upcoming half marathon. This of course, is the danger of destination races – whether I ran or not, I still had a California vacation booked. I decided to make the best of it and attempt some kind of run/walk strategy. 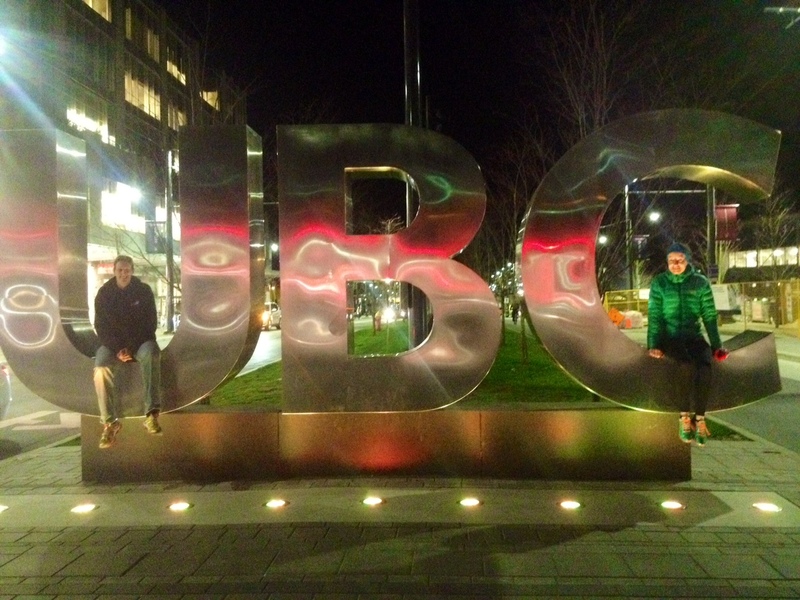 After a short chat with Coach Luke, we had a plan: 5 minutes run, 1 minute walk, repeat for 21.1km. I hadn’t used this kind of strategy since I had learnt to run six years ago. Then it had been necessary as I didn’t have the ability to run further. As I had got fitter, I had left it behind to become a ‘proper’ runner that didn’t need to take breaks every few minutes. As much as it felt like a step backward, I knew it was a smart choice if I was to attempt this distance without the requisite training. And whilst an x-ray had confirmed that the fracture was officially healed, there was still doubt about the strength of my ankle over 21km on the road. I got on the plane in -10 degrees and stepped off a few hours later in Los Angeles to perfect running temperatures. The day before the race I was due to pick up my race package at the expo. Which, once I located it amid the sprawl of Disney, was very well organised and enjoyable. Whilst at the expo, I took in a presentation by Jeff Galloway, Olympian and writer of a number of running books. Obviously he was promoting his preferred run walk run brand of training, which it turns out, involves a lot more walking than I was planning. His message was to take walk breaks right from the start, reasoning that any energy saved early on is available for use during the last few miles. All in all, it was a very interesting talk. I might not be switching to the 15/15 seconds he claims to use these days, but it definitely gave me more confidence in the plan we had selected. The race itself starts at the eye-wateringly early time of 5:30am. Presumably to accommodate the extensive road closures and protect park revenues. So, at 4am I woke up, ate breakfast and walked over to the start. I spent a tense few minutes on the way over, trying to get my Garmin to co-operate and pair with its heart rate monitor; I decided we were no longer friends. 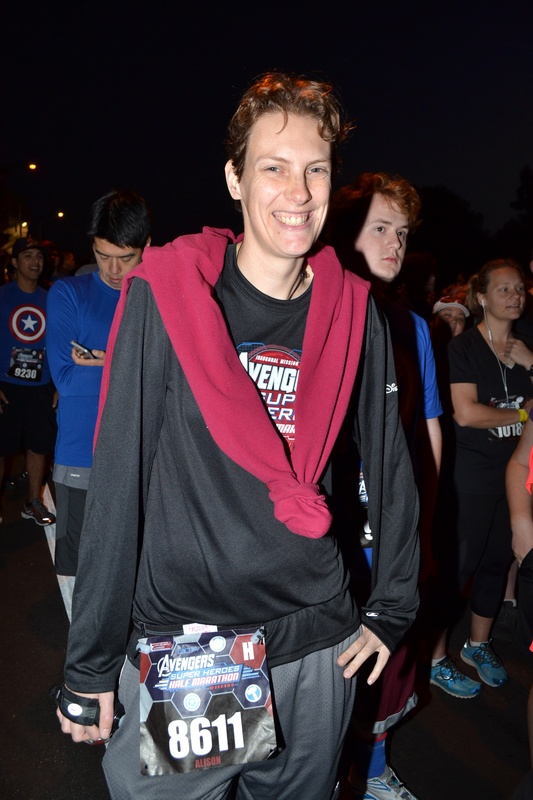 I lined up amongst the costumed runners, a plethora of Captain Americas, Thors, Ironmen (the Marvel kind, not the triathlon kind – though, who knows?) and other assorted superheroes. The race has around 12,000 participants, seeded into starting corrals based on anticipated finishing time. I was in corral H, the last and largest; populated by slowpokes, walkers, first timers and anyone else who had been unable to prove their pedigree by providing a result from an acceptable prior race. Of the 12,000, probably 11,500 started ahead of me. The only way was up. As it turned out, it was easy to pace slowly at the start, as going any faster would have meant dodging between walkers. Even during my walk breaks (which I took from the start – thanks Jeff) I was faster than many of these people. I decided that even whilst walking, I would make it a goal to keep passing people. 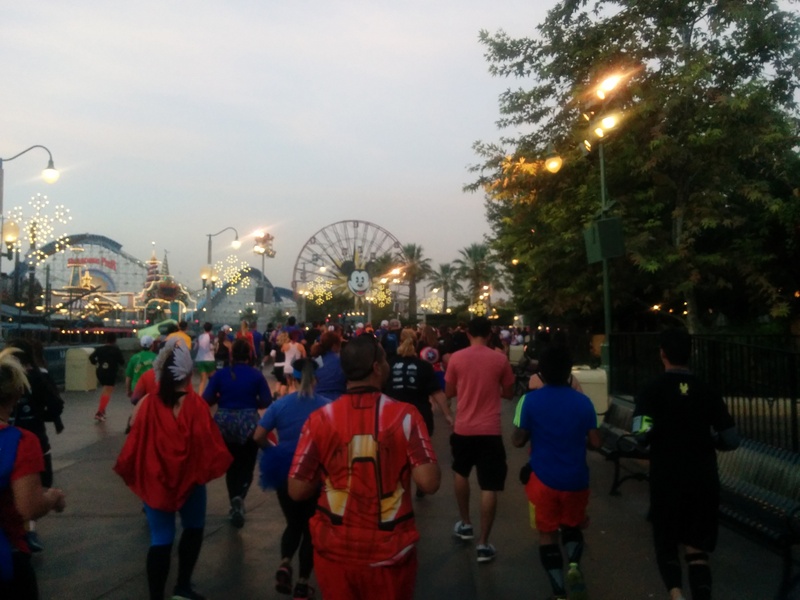 The first 5km of the race winds through the two Disney parks. Actually it was rather less glamorous than it sounds and we took in a significant number of back lots. 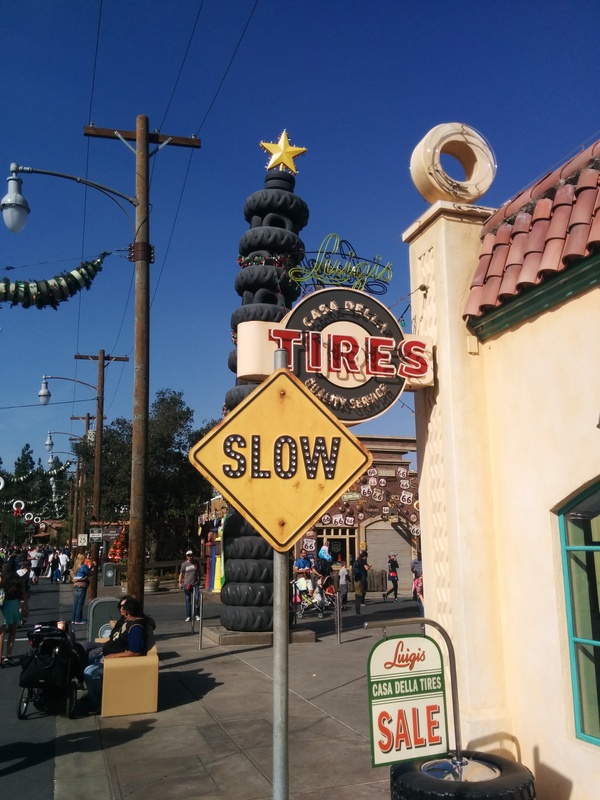 We did however run through Cars land, towards Paradise bay inside Disney California Adventure. We then entered Disneyland proper taking a route through Frontier land and Fantasyland, up through the castle and onto Main St USA before heading out onto the streets of Anaheim. Progress was occasionally hampered by runners occasionally unexpectedly darting off across the route to join a line (this is Disney!) to take a picture with Thor or Captain America. Later as I hobbled around the park, I tried to identify the route we took and was amazed at what I must have missed as I focussed on the job in hand. I do remember almost breaking the other ankle on this tram line! As we left the park, the wind started to pick up. I kept running and walking, running and walking, trusting the plan and obeying the Garmin every time it beeped. It became my new best friend, holding my hand through this challenge. I forgave it for the stress it caused before the start. The wind got stronger, soon we turned onto a path which ran alongside a large expanse of sand. The sand was being blown across the course painfully hitting exposed skin and making it very difficult to see or breathe. I was reduced to running with my eyes closed, hoping not to run into someone else doing the same. Capes were snapping in the wind and shields and hats flew by. I held onto my race number for dear life as it flapped in the wind, it represented my access to the finish line and more importantly, my official timing chip was stuck to the back of it, so it was clearly a vital piece of kit! 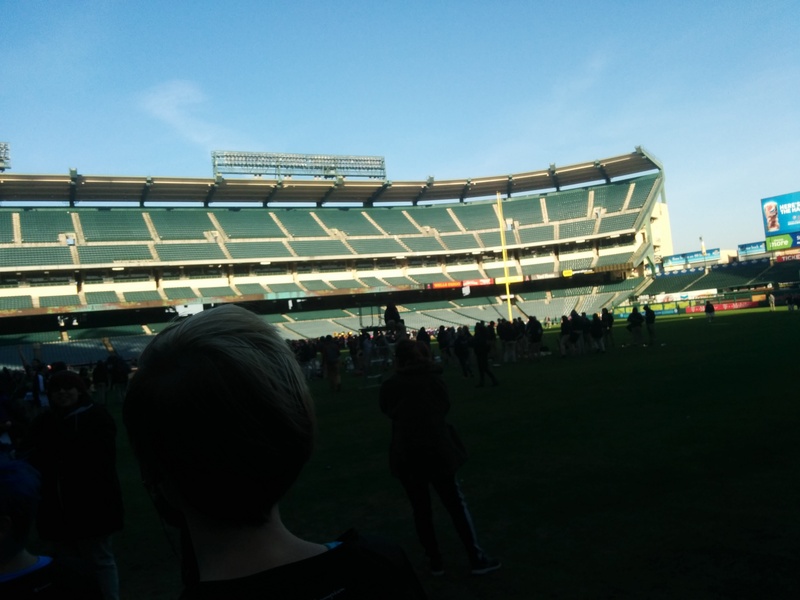 Respite came as we approached the Angels baseball stadium where we entered through the tunnel and ran around the home plate before leaving. No seriously, I have no idea how cool it is, and I have not even a passing interest in baseball, but I have to admit, images of a dozen movies ran through my head in that moment – yeah, it was pretty cool. I think it was a bit of half marathon brain addled maths. But in that moment I calculated that I was on track to finish in over three hours. Disappointed didn’t even cover it, this was the hardest part of the race for me. I decided the best thing to do was to keep going and hope I was wrong. Three hours would be a good achievement because I knew I was doing my best. Perhaps I wasn’t trying hard enough? No! Don’t change anything now. By mile ten I was feeling better. I took my last walk break at mile eleven. When my trusty Garmin, which had brought me so far, dutifully beeped to alert me of my upcoming walk break, I ignored it. Soon afterward, I questioned this decision. But I knew it was the right one. Every beep I ignored, galvanised me further. I tried to speed up, in fact this turned out to be the fastest kilometre of the race. It felt good to open up; I was passing people like crazy now, I just needed to keep it up to the finish. 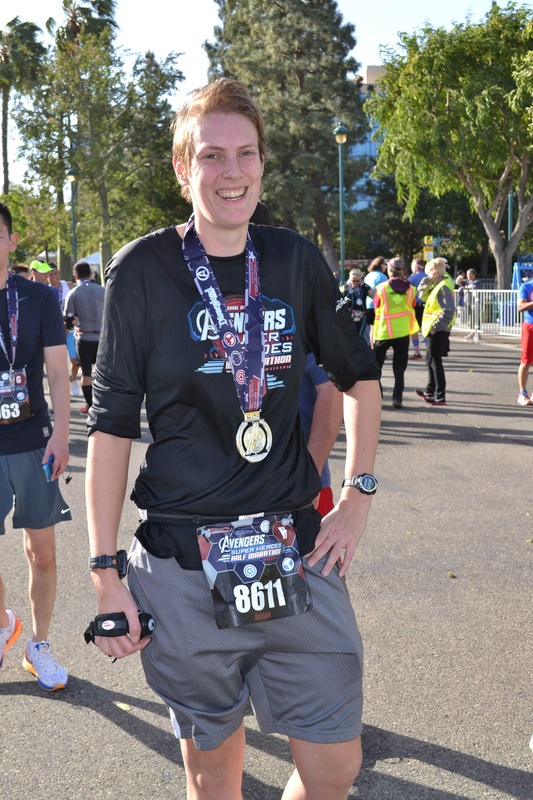 I crossed the line and collected my fancy Disney medal. 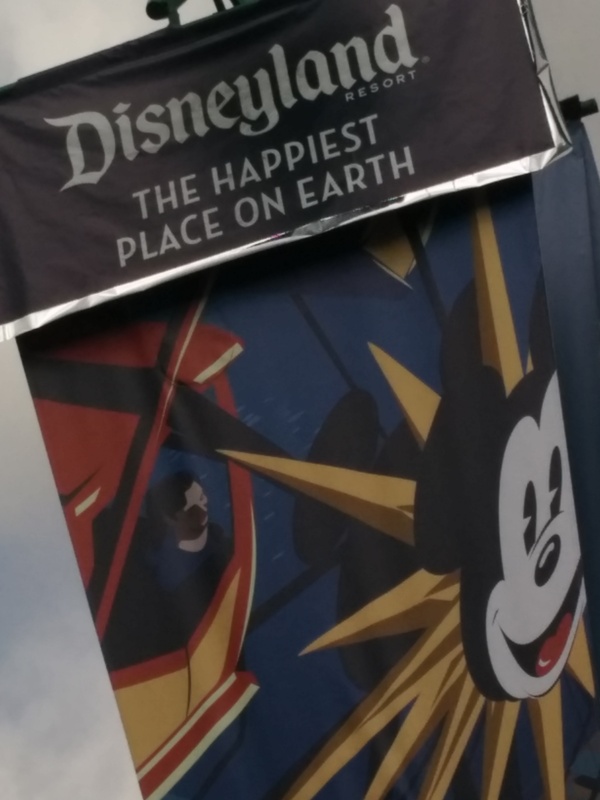 Someone handed me a Disney branded space blanket which would no doubt have been more effective if it hadn’t immediately turned into a parachute. The wind was so high that tents were flipping in the finish area and they had to cancel the awards ceremony and move everyone on. I don’t know if I could have gone faster, though, I think it was probably the right decision not to try on this occasion. I can run a half marathon. I know that a lot of people claimed to know that about me beforehand, but I certainly wasn’t sure. It is also reasonable to believe then that I could also run a marathon in the not too distant future. Even if it will be slow going. Jeff Galloway was right, saving at the start pays of at the end. That was a new experience for me. Trying to walk around Disney after a half marathon is a bad idea. Do not attempt maths on the course, and never look at your watch. Pursuant to my goal of increasing mileage gradually, I decided to sign up for a small 6km fun run as a stepping stone to a slightly more serious 9km cross country race. My hope was that running off road would afford my ankle a more forgiving surface whilst I built up distance. 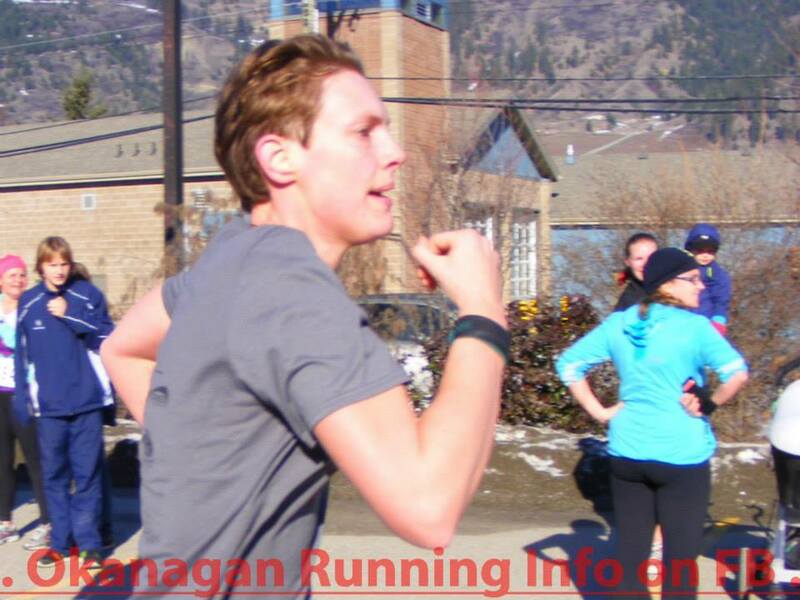 The Kokanee Fun Run is a very small, family oriented affair intended as a fundraiser. At the same time there was a 3km run, popular with children. Immediately, a whole hoard of children sprinted off a head of the adults. I tried to keep up. They are just little kids. But I quickly realised this was unsustainable. I slowed to the pace that I knew I could and should be running at to complete the course. By 1km, most of those little speed demons had slowed down and I congratulated myself for finally learning the lesson of the tortoise and the hare, after only 34 years! Speedy children aside, my run was going well, I fell into a rhythm. I caught myself smiling. A friend even remarked on how well I was running. I knew he was right, I just didn’t know why. I had taken four months off running and now I found myself running faster than ever before. Maybe I should be injured every summer? I passed one last kid. Then we were directed up a set of stairs and off the nicely groomed gravel path and onto a mud trail. Suddenly I found myself unable to run on the uneven surface. I felt so uncoordinated. The kid came back past me. I pressed on carefully, marveling at how difficult this had suddenly become, and soon came round for my second lap. I was on my own now, the people around me stopping at 3km. I considered stopping with them, it was only a fun run after all. But my newfound determination surprised even me, I knew I could do this. Back along the gravel path, I ran, dreading that upcoming trail. The second time was just as bad as the first, but at least I knew it was coming this time. I just didn’t seem to be able to place my feet firmly, my ankle proving that it was still weak after it’s unexpected vacation. Finally, the gravel returned and I ran to the finish. 36:06 – about the same pace as I kept on the road, very encouraging, especially considering how much I was struggling on the trail. I felt so tired, how could I go half as far again in just a couple of weeks? 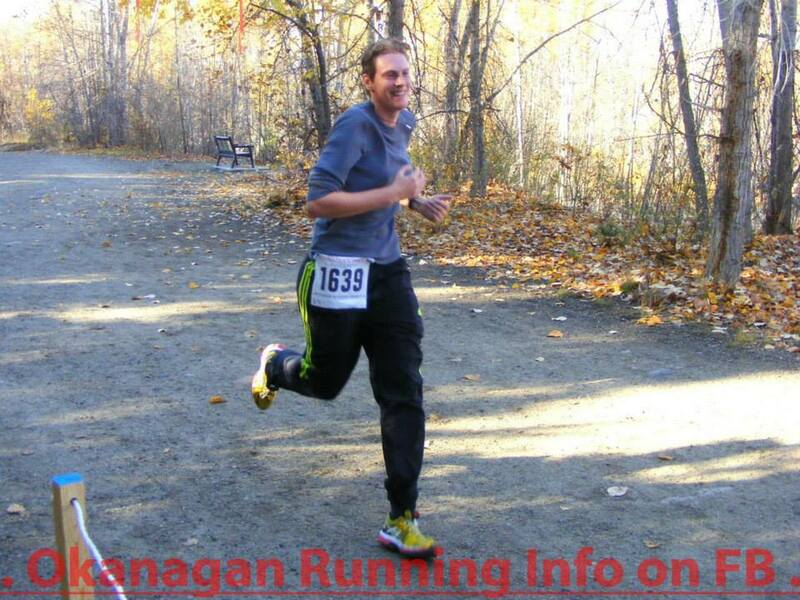 The Larry Nicholas Memorial 9k is part of the Interior Running Association cross-country series. My memories of the compulsory annual cross country at school are 100% negative – rain, fog and a large muddy field and being forced to (try to) run in the cold. I would never have guessed that one day I would do this voluntarily and even pay for the privilege. I was far from confident going into this race. I didn’t know how well my ankle would hold up for 9km on the trails that had given me so much trouble only two weeks ago. To this end, my leg sported some rather fancy athletic tape to support the joint, but I was prepared for it to be slow going. 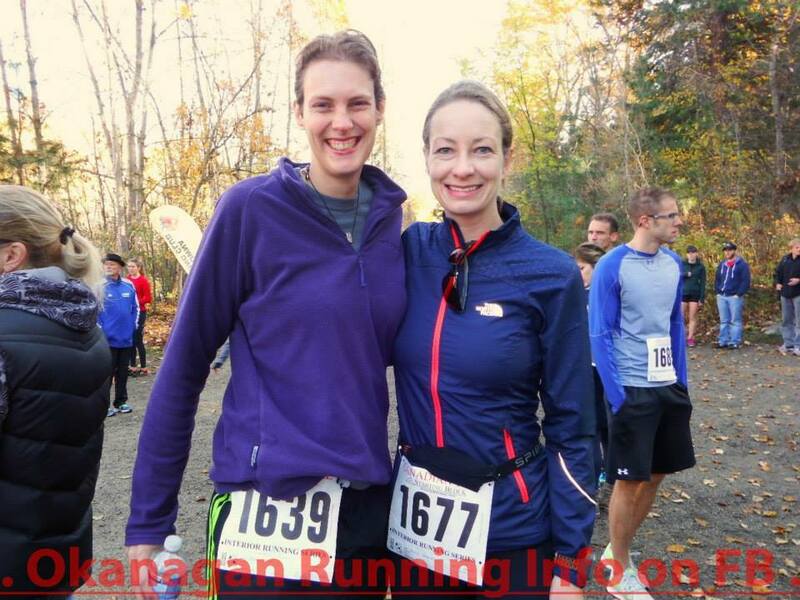 I was also concerned because being part of the IRA series, this event attracts real runners – and by that I mean fast. After much pleading, Kay laughingly promised to personally hold up the finish line if they attempted to dismantle it before I had crossed (another bad memory from my childhood), even though she assured me she was certain this would not be necessary. The course was three laps of undulating trail. I focussed on trying to remain consistent. A lot of people passed me early on and I wasn’t sure how many might still be behind me. I really enjoyed the course, enough terrain to keep it interesting, but not so much as to be too difficult and quite a pretty little trail. Unfortunately every lap felt interminable. Lap two was much the same as lap one, except a little slower – let’s call that smarter. I was breathing hard, but felt good. Suddenly people began passing me again, fast. 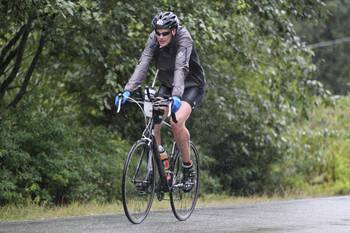 It took a few moments to realise I was being lapped – and I wasn’t even half way around. The initial disappointment soon gave way to amazement, they were so fast. 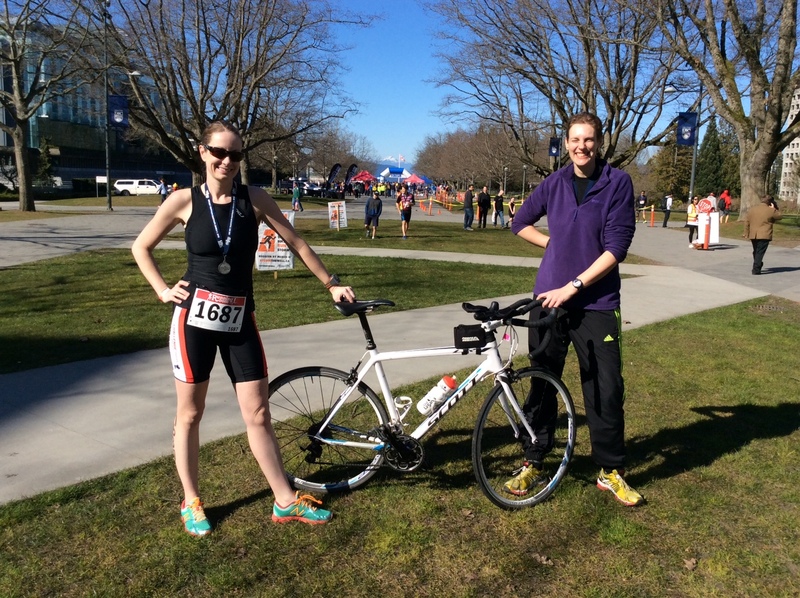 “I don’t think I could even keep up with them at a sprint” I marvelled. As I started the third lap, I was definitely tiring, the pretty little hills were growing into mountains and the muscles in my legs were screaming for me to stop. But somehow I knew I could finish. I walked up the steepest hills near the end and then turned towards the finish. Thanks Dirk, for taking the picture! I finished strong, a smile crossed my face. I’m really starting to enjoy this. I must have misread that! It didn’t feel like a particularly good run. Perhaps it’s time to re-evaluate what a good run might feel like. I have had so many recent improvements and achievements that I don’t quite know what to expect anymore, but it’s exciting stuff! Where will the next discovery take me? What if it isn’t healed properly? What if I’m breaking it again? 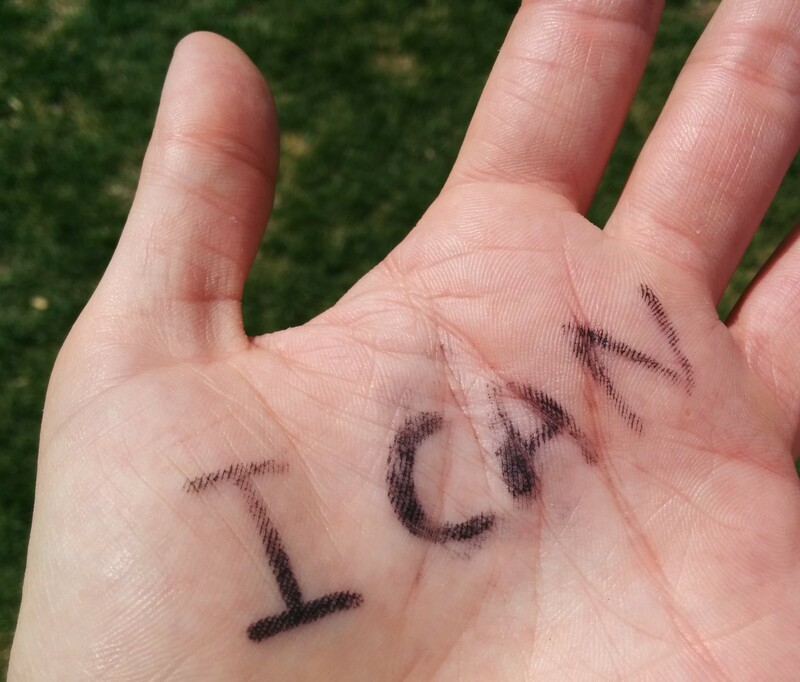 What if I go too fast and end up unable to run for months again? What if the doctor was right and I can never run any significant distance again? What if the world implodes tomorrow? I had planned on increasing my mileage over the summer and fall leading up to a half marathon in November (stay tuned for more on that). But now I had been reduced to volunteering at events and watching everyone else have all the fun. Or promoted to volunteering – which can also be fun. I decided to try a 5km run. 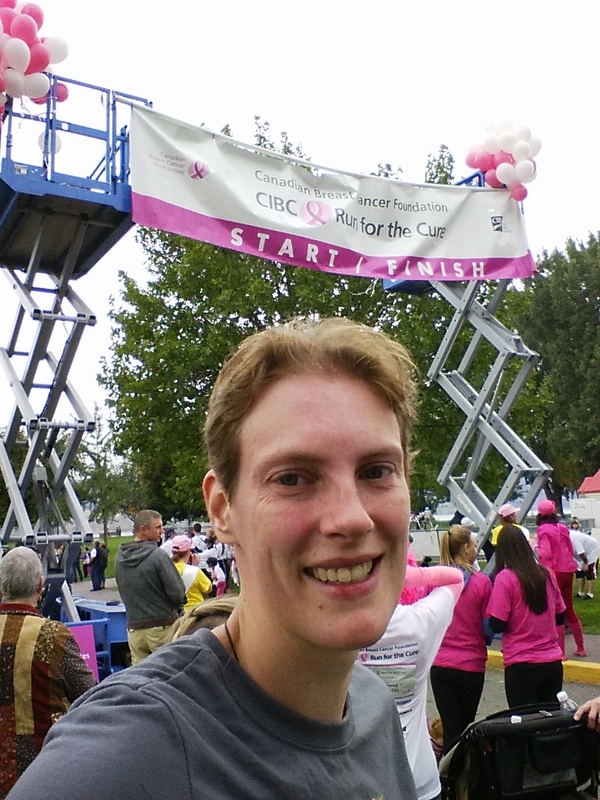 I chose the annual Canadian Cancer Foundation Run for the Cure, a no pressure 5km event where I could test things out. Eagle eyed viewers will probably note that I have already completed a 5km run at Cultus Lake, however, that was mostly on flat trails and beach which are rather more forgiving on the body than the concrete paths of City Park. I had also been very conservative during the run as my ankle was clearly barely healed, and was hoping to feel some significant improvement. I got there in time to watch the inspiring, traditional parade of Survivors across the stage. Then it was a quick warm-up (which ironically turned out to be harder on the ankle than the run, lateral movements being more painful) and we were off. The Run for the Cure is not a competitive event, with many people walking the distance. This helped me to pace myself at the start. I forced myself to keep running, trying to quash the aforementioned ‘what if’ analysis going on in my head. I told myself I would stop if any pain presented itself. About half way around, I began to believe that I could do this, around 3.5km I saw a friend cheering (Maybe not specifically for me, but it still made me smile). As I came back into the park, about 500m to go I wondered if I could speed up into the finish. I gave it a try. Just a little faster. By only 2 seconds, I admit, but still the fastest 5km I have ever run. 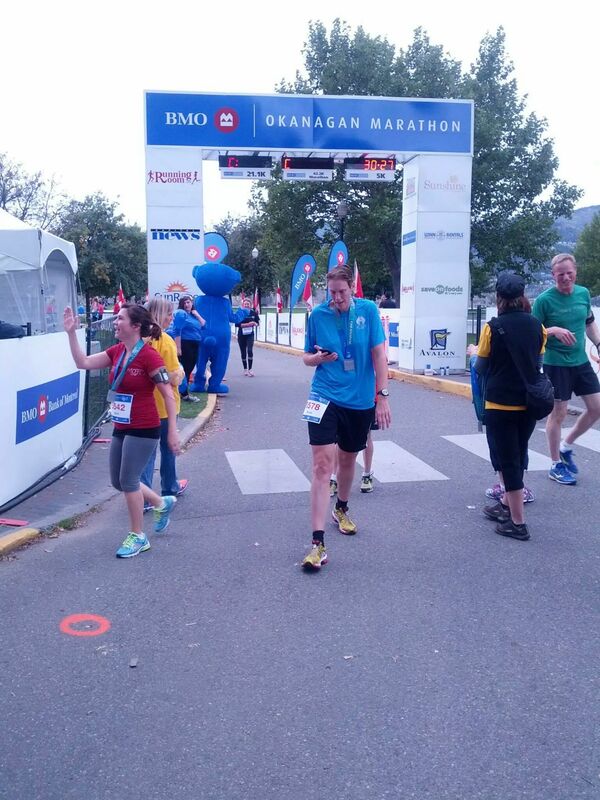 Two weeks later was the Okanagan Marathon, which has a number of shorter races attached for those of us not quite fit enough or crazy enough for 42km. I had planned to do 10km, but on reflection, I decided it would be smarter to stick to 5km at this stage in the game. Some might question, since I was being so smart, why I then entered into a bet to try and crack 30 minutes. No we do not need to analyze why winning the bet left me liable for the post race meal, contrary to usual betting practice – I was obviously blinded by the excitement. In the event everything went remarkably well. Almost boringly so in fact, you definitely don’t need a running commentary (awesome pun – sorry about that). 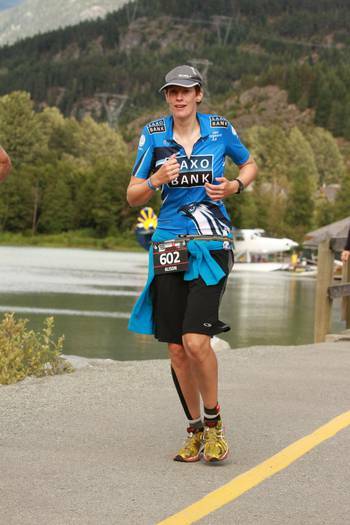 The pain in my leg wasn’t particularly worrisome and I felt strong throughout. This time I knew I could make a fast finish. 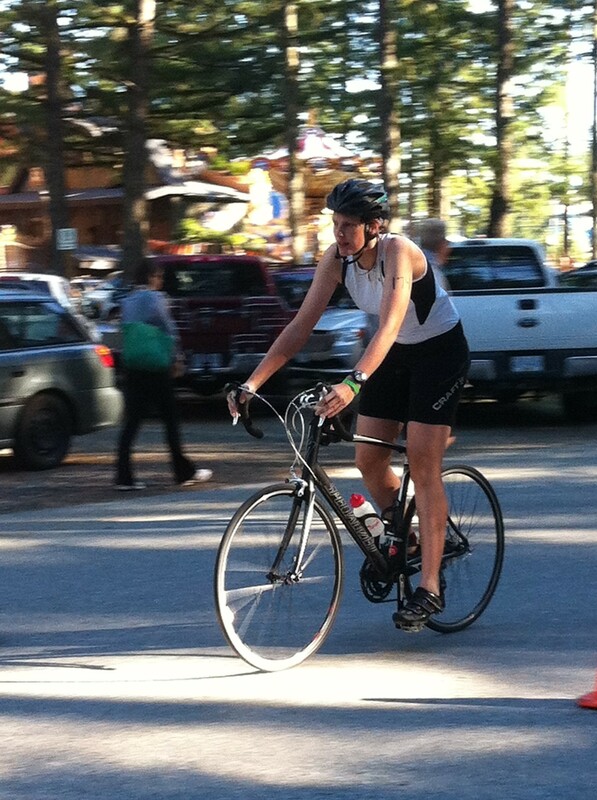 When I turned into the finish straight, my eyes immediately sought out the clock. Take into account the seconds before I crossed the start line in this non chip timed event and my GPS confirmed, I missed the 30 minute mark by 6 seconds! It’s funny how knocking 40 seconds (yes, 40 seconds!) off your PB can somehow be negated by coming in at 30:06. – Runners are weird like that. Hey did I just call myself a runner? 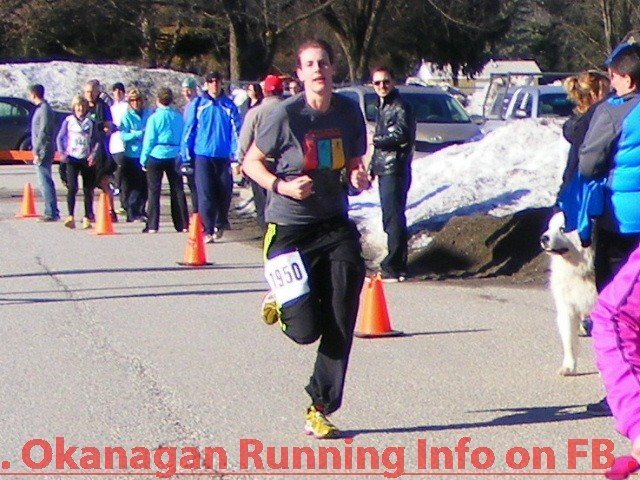 Classic runner shot, turning off my GPS instead of smiling for the camera!